Small time hood who came into prominence after Al Capone pumped six bullets into his body. Joseph W. Howard lived upstairs his mother's fruit store at 2900 Shields Avenue. At the time of his death, he was only 28 years old. He had had a long police record for his young age. Mostly a burglar, he had also dabbled in beer running. This latter occupation was discounted by police, claiming Howard was known in criminal circles as a "dynamiter". This meant he occupied his time bomb tossing establishments who didn't dish out extortion money to him. Some stated that Howard himself had killed three men in his short criminal career. At 2300 South Wabash Avenue, stood a drinking /sandwich/ cigar stand owned by Heinie "Hymie" Jacobs. It was the gathering place for labourers and the seedy type who dabbled in low affairs. Here deals could be had on stolen goods or on information on how to obtain such stolen items. On the evening of May 8th,1924, Joe Howard enters Hymie Jacobs' saloon and walks over to the back of the saloon to talk to Tony "Mouth" Bagnolia, also known as "Bagno". He was a one time Torrio bodyguard /gunman, who was indicted for the murder in 1918 of one John Norris. Bagnolia was also one of the gang of men who shot up the Cadillac cafe at 2134 Wabash avenue in 1920. Sitting with Bagnolia and Joe Howard was George Bilton, an automobile mechanic and Clifford Eaton who's wife ran a beauty parlor at 1317 North Clark st. They were talking amongst themselves when at approximately 6:30 pm, two men entered Hymie Jacobs' saloon. One was a large built man and the other of smaller stature. According to one witness Howard was asked to step outside with the larger fellow, but he refused. The large built man grabbed Howard by the collar and pointed a gun to his cheek and fired in quick succession. Six shots made their way into Howard's body, four bullets in the face and two into his right shoulder. Joe Howard's body was sent to the undertaking parlors at 2456 Wentworth avenue where an inquest was issued. Within thirty minutes of this shooting, the police immediately started to look for a certain Al Brown who ran a notorious dive called the Four Deuces. Brown was the Hyde personality and police soon found out that that Dr.Jekyll part of that equation was none other than Alphonse Capone. He ran a used furniture store as front right next to the Four Deuces. Witnesses to the shooting, although there were many, proved totally fruitless. Many had suddenly lost their memories. Bets were taken that Al brown would never be convicted, in fact, many hated Joe Howard and were kind of glad he was gone. He was an harrassing pest and probably thought that he got exactly what he deserved. One of the witnesses who gave the most info was Mr. David Runelsbeck, a 75 year old retired carpenter who was living at 2220 Wabash ave. He told Chief Hughes exactly what he saw. He claimed he heard Howard saying "Hello Al" and that the big man grabbed howard and shot him point blank. Later Runelsbeck told police he couldn't identify the man named Al even if he stood right up to him. Police wouldn't be able to solve this one.The owner Hymie Jacobs was convieniently bent over with his head in the safe to pick up a bag of nickels at the precise time of the shooting. Police looked for the other three men named Bagnio,Eaton and Bilton. The headlines of the Joe Howard murder May 9,1924. Al is named as Tony "Scarface" Caponi alias Al Brown. In 1960, a rusty vault was uncovered in an investigator's office and opened. Inside were 1930 files and wiretap reports on Capone gang members. Joe Howard's murder is mentioned in it. Although no one can vouch for it's veracity, it states as follows; Tony Bagnio alias Bagno weighed 170 pounds had black hair and a scar on his cheek. In 1920, he was in with Capone and Willie Heeney and at times was a bodyguard for Johnny Torrio. At this time there was a hood named Joe Howard hanging around 22nd street where Jack Guzick and Denny Cooney were operating a gambling house. One night Howard caught Guzik coming out of the place and pushed Guzik into the doorway and stuck him up for $1,500. Guzik tried to talk Howard out of the holdup,offering him a job. Howard said he would not work for a pimp like Al Brown. Guzik did not tell Capone, but someone who was there did. 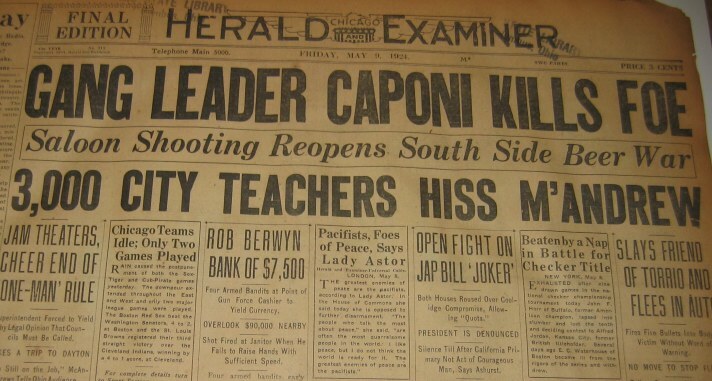 Capone sent out for Tony Bagnolia and told him to hunt up Howard and take him to Heinie's saloon at 23 and Wabash and feed him all the drinks he could swallow. Bagnolia did it. When Howard was feeling his drinks, word was sent out to Capone who immediately came over, pulled out a gun, and effortlessly shot Howard to death. At 6:30 pm on the night of May 8, 1924, Heinie Jacobs stood leaning on the dusty cigar case in the front of his Chicago speakeasy at 2300 South Wabash Avenue. To his left, motionless on their double hinges, hung the swinging doors familiar to the tippler of the generation before A murmur of voices from over the partition informed Jacobs that his solitary customer, Joe Howard, a minor habitue of the district, was chatting with the bartender. said, and passed him without speaking. He thought, he added naively, They might have been policemen in civilian clothing." "I could see their legs under the half-doors," he testified at the inquest. "I heard them arguin' with Joe Howard. I ducked behind the cigar case. When I crawled out the men had gone and Joe Howard was lyin' on the floor in front of the bar with blood all around him. My bartender was in the icebox and he didn't see nothin' either•"
The deputy coroner asked the routine question: "Jacobs, do you sell alcoholic drinks there?" "No, sir; my place is a soft drink parlor•"
The medical report described six bullets wounds through Howard's skull and the coroner's jury called the homicide a murder by persons unknown. Hymie 'Heinie' Jacobs owner of saloon being question by assistant states attorney William McSwiggin. Notice McSwiggin's facial features in not believing a word that Jacobs stated about not seeing the killer. Al Capone was arrested on July 11,1924 and when questioned about the murder by assistant states attorney William McSwiggin Capone replied that he only knew Howard slightly, never had any trouble with him and can't understand why he was killed unless it was over the election last April. Capone was released for lack of evidence or witnesses. 6234 was the case number of Joe Howard's murder and he was listed in it as being killed by persons unknown. Thanks to the witnesses all having a case of "Chicago Amnesia". The bigger reason for Capone being let off the hook was the senseless murder of 14 year old Bobby Franks that happened on May 24,1924. This would take all of Chicago's police resources and the public would immediately forget about Joseph Howard. 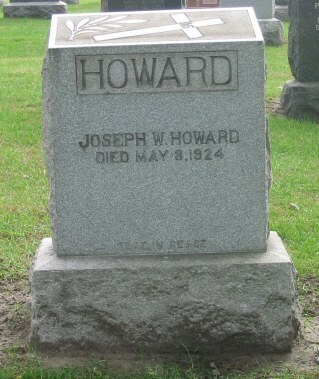 Ragtime Joe Howard's grave in Mt. Olivet.